Are Dan and Blair over? Why do we care about Raina? Will Vanessa stop pining for Dan? Gossip Girl executive producer Joshua Safran discusses all this with TV Guide. With a new episode on tap tonight and just three more after that this season, here's what Joshua has to say about the above topics, as well with Blair's trio of suitors. On whether Dan and Blair are over: "No, keep watching. Of course that story is not over ... What I will say is Dan and Blair were four seasons in the making." "To come to the place where they were able to admit they were friends was four seasons in the making, so hopefully it will not take another four seasons to find another level in their friendship. The story between them is not over." On Blair's love triangle/quadrangle: "There are people who we're in love with when we're 16, and they're not the people you end up with - unless they are the people you end up with. 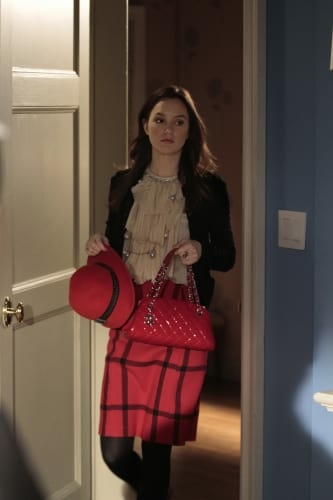 The writers are on the same journey with Blair as she takes it." "Who knows where it will end up? Obviously, Chuck and Blair have a bond that will never be severed, but does that mean they end up together in a conventional sense? We'll see." On whether Gossip Girl producers have the endgame planned out: "No. That's one of the things I love so much about TV. You get to grow with the characters. The only time I would ever say we had an endgame is if we knew the show was ending." "The show is not ending and we look forward to going down the road with these characters. Hopefully that's many years off..."
On whether cast members want to move on: "At this point, we're waiting for our Season 5 pickup and our actors are all contracted through Season 6, so we look very much forward to working with them for at least the next two years." On Jenny's future: "Jenny remains very much a part of the show. As for whether she returns this season, I have to say wait and see — I don't want to spoil it! As for the future, we're still waiting on a Season 5 pickup before we decide anything." On whether Ben's coming back: "There are no plans in the next five episodes, but the story continues. We had planned well ahead of time that this was going to be the number of episodes for that story because it was part of a larger arc." "It had to lead to Lilly's arrest. So, it wasn't a question of working or not working - it was always our intention to leave it where we did. We're happy with the way it played out. But it's Gossip Girl, and there's always a chance for people to return." "In our minds, the doors are never closed to anyone." On Raina's upcoming role: "The Thorpes are all part of the same spine, which is sort of 'the sins of the father,' or parents rather, that we've created this year." "You'll see in the last episodes what exactly transpired between Bart and Raina's father Russell and Raina's mother - that story is of a piece with the Lily story." On newcomer Charlie: "She hasn't been allowed to be a part of [the UES world], so she's coming to grips with just what she has missed her entire life." "Whether it's the family she didn't know or the money she never experienced, it's about what that does to her. Also, it's about her maybe having feelings for ..."
On whether we're supposed to hate V: "Vanessa, in my mind, serves an important purpose. She's Dan's childhood friend, and she's watched him slowly become more and more consumed by the Upper East Side - or pulled into it, as it were." "His father married into it. She's sort of that voice of reason for Dan." "Whether or not that's true reason or what she thinks is true reason, Dan is going to a place she didn't want him to. That's what we deal with in terms of Vanessa." "That's what we play with. In these last five episodes, she's very much trying to help get Dan back to his roots. There are fans that don't like her and fans that do." "But as writers, she serves a very specific purpose."